CHINA has urged Britain to proceed with a nuclear power plant project partly invested in by a Chinese firm, saying the facility has firm support from London (倫敦). The call came after Britain’s new government said it would review the project again. The plan by France’s EDF (法國電力公司) to build two reactors with financial backing from state-owned China General Nuclear Power Corp (中國廣核集團) was championed by Prime Minister Theresa May’s (文翠珊) predecessor, David Cameron (卡梅倫), as a sign of Britain’s openness to foreign investment. But just hours before a signing ceremony was due to take place, May’s new government said it would look at the project again, raising concern that Britain’s approach to infrastructure deals, energy supply and foreign investment may be changing. 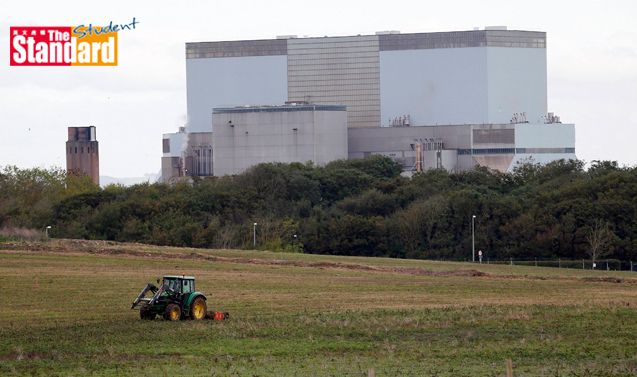 May was concerned about the security implications of a planned Chinese investment in the Hinkley Point (欣克利角) nuclear plant and intervened to delay the project, a former colleague and a source said. Chinese Foreign Ministry (外交部 ) spokeswoman Hua Chunying (華春瑩) said Beijing had “noted” the decision. “I would like to stress that this project was agreed upon by China, Britain and France in the spirit of mutual benefit and cooperation, and win-win cooperation, and has always had the strong support of Britain and France,” Hua said in a statement. China “hopes that Britain can reach a decision as soon as possible, to ensure the project's smooth implementation", she added, without elaborating. Britain and EDF first reached a broad commercial agreement on the project in 2013. China got involved two years later.